How do public officials and individuals make decisions? How do you make decisions? It isn’t always the factual, logical information that results in your decision. Our heart and emotions are called into play as well as our values and sense of ethics. The stories we tell, the pictures we paint, how we frame the issue, and the words and body language we use are key to influencing the decision making of others. This webinar focuses on how we make decisions and how we as young citizen scientists and youth organizations can improve our communications with decision makers, neighbors, friends, and community to influence the decisions they are making. We will focus on what the research tells us and the strategies youth and adults can use to be more effective in working with decision makers. We hope these strategies will increase the role of science, especially the science work that is done by and with youth, in the making of these decisions. This webinar was sponsored by CYFERnet Technology and recorded in December 2013. Craven, G. (2009). What’s the worst that could happen? A rational response to the climate change debate. The Frameworks Institute (2005). Framing public issues toolkit. Innocent, T. (2013). Making Sense of Uncertainty. Jacquet, J., K. Hagel, C. Hauert, J. Marotzke, T. Rohl & M. Milinski (in press) Intra- and inter-generational discounting in the climate game. Nature Climate Change. Karrer, Beldia, Dennison, Dominici, Dutra, English, Gunawan, Hastings, katz, Kelty, McField, Nunez, Obura, Ortiz, Quesada, Sivo, Stone (2011). Science-to-Action Guidebook. Kuhn, T. (1962). The Structure of Scientific Revolutions. Reyna (2013). Risk Communication and Risky Decision Making: From Viruses to Vaccines. Vaughan (2007) Citizen science as a catalyst in bridging the gap between science and decision-makers. 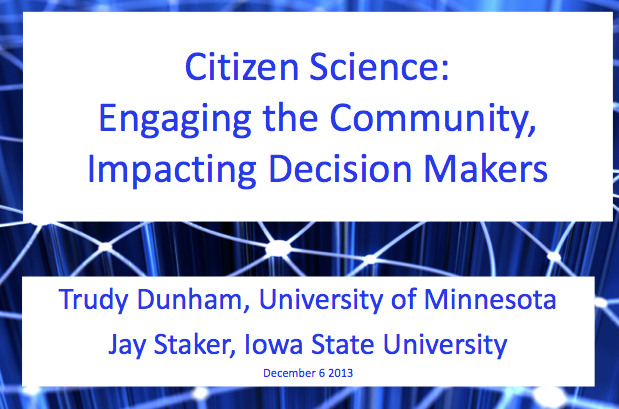 Citizen Science Toolkit Conference. Westheimer & Kahne ( Summer 2004). What kind of citizen? The politics of educating for democracy. American Educational Research Journal 41 (2).